Posted by Florent Georges, on 2008-10-30, in calabash, oxygen and xproc. XML Calabash, the XProc processor from Norman Walsh, becomes more mature from day to day. Here is a very simple (but very limited too) way to integrate it into the great oXygen XML IDE. Well, the word integrate is maybe too much for this simple trick, that will just add a button in the toolbar to execute the currently edited XProc definition file. But at least that will prevent you to switch between your IDE and a console. Of course, you have to set the absolute path to the JAR files on your machine. Be sure to use ":" as the path separator on Linux and ";" on Windows. 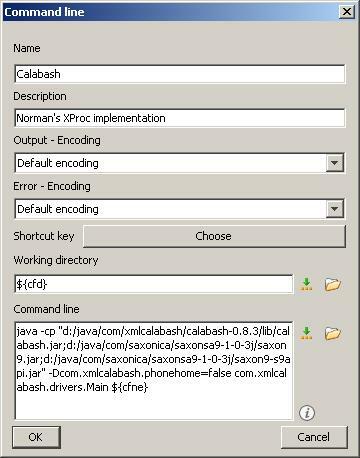 You can also set additional options like -Dcom.​xmlcalabash.​phonehome.​email=your@​email.​com. In other words, just use the command line you usually use to launch Calabash. When this is done, you will have a new button on your toolbar, called Calabash (be sure to have selected the External Tools toolbar.) 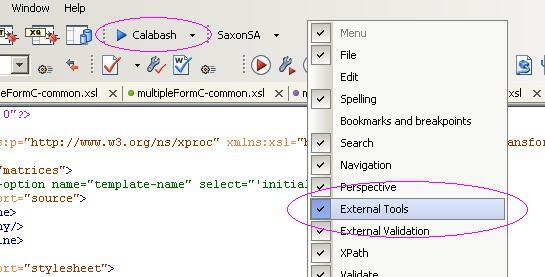 When your are editing an XProc definition, you can press that button to execute it with Calabash, viewing the output in the result panel. Posted by Florent Georges, on 2008-10-30T18:58:00, tags: calabash, oxygen and xproc.